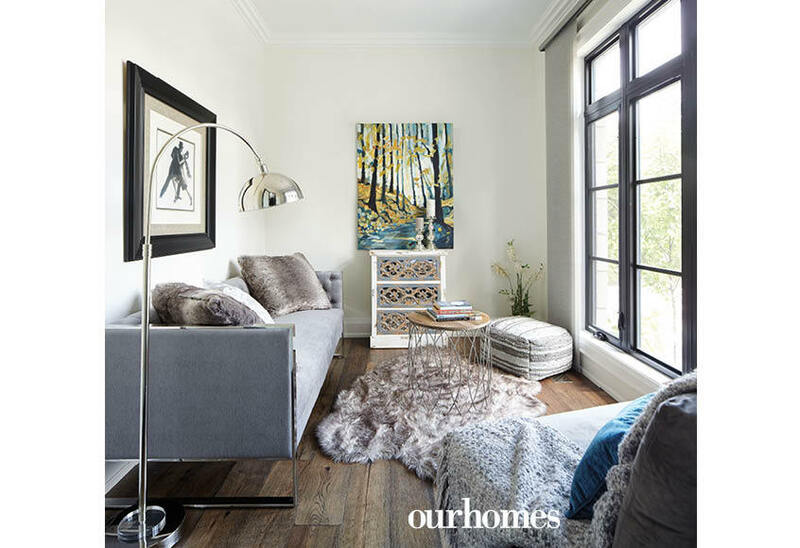 An experienced couple share their beautifully designed home. 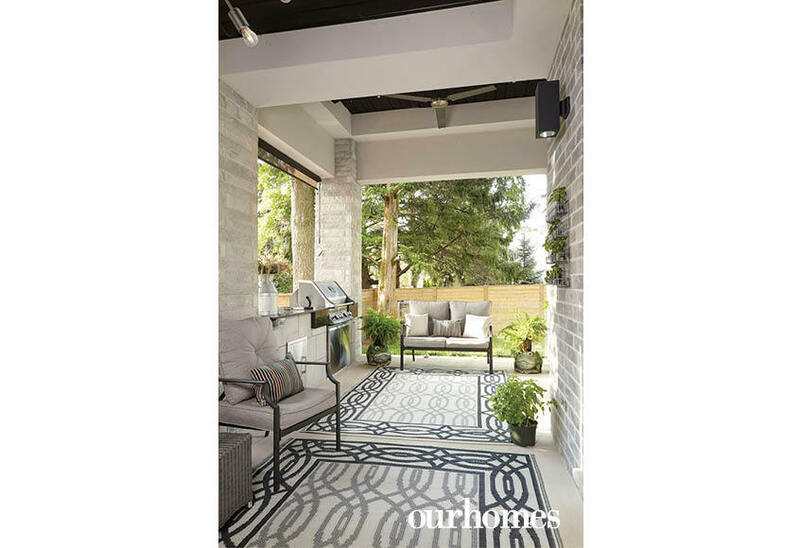 A version of this article originally appeared in the Fall 2018 issue of OUR HOMES Hamilton and Area, p.26. Find local businesses in our Hamilton directory. There's nothing quite like practice to pave a path to perfect. 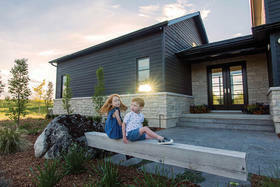 So when Marcello Alaimo of Exquisite Living Homes and Paula Alaimo designed their new family home in Ancaster, having built many before, it didn’t take them long to design a home that’s custom-made to fit their growing family. Vincent Fracassi of Coldwell Banker Community Professionals, Brokerage, helped locate the ideal property for the Alaimos. 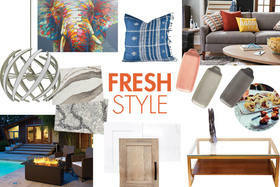 “Our vision for the house was French chateau, but with a modern twist,” says Paula. That idea guided most of their decisions, including diamond-shaped roofing shingles with a European feel, and black-framed windows (Golden Windows Ltd.) with a grill effect for a mix of traditional and new. Paula designed a driveway that’s a bold mix of large square pavers (Permacon), laid by Schuit Landscapes. The effect is a little old world, a little new, and that was exactly the plan. The driveway shows off a luxury Genesis G70 Sport, courtesy of Genesis Niagara. The three-car garage opens to the backyard for easy access. 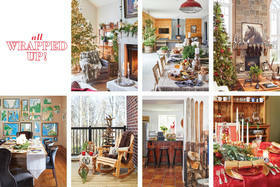 LaPointe Interior Design & Landscape assisted with plant selection. 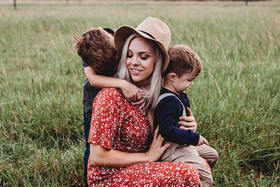 Married for 12 years and with three young children, Paula and Marcello’s decisions about layout were often fuelled by the practicalities of family life. 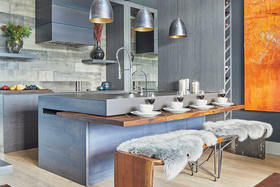 In the kitchen, they opted for a family dining table in line with, and attached to the island. “The kids are close by if they’re sitting here and colouring or working on homework while I’m cooking,” says Paula. 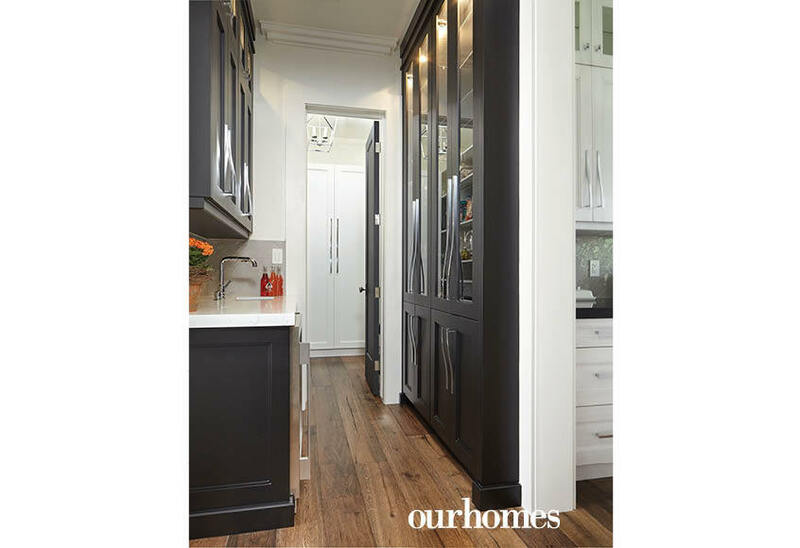 They chose cabinetry with a subtle profile to add warmth and a bit of tradition. 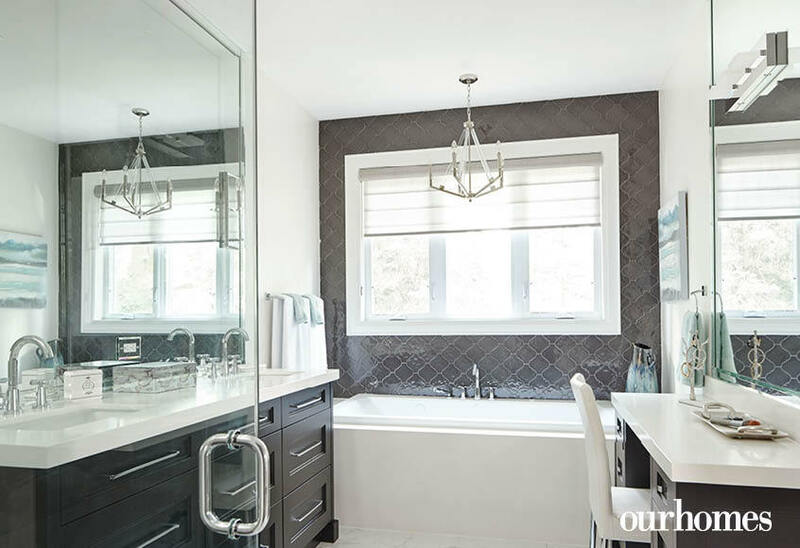 Arabesque tiles bring elegance, and sleek, oversize hardware in a polished chrome introduced the modern. 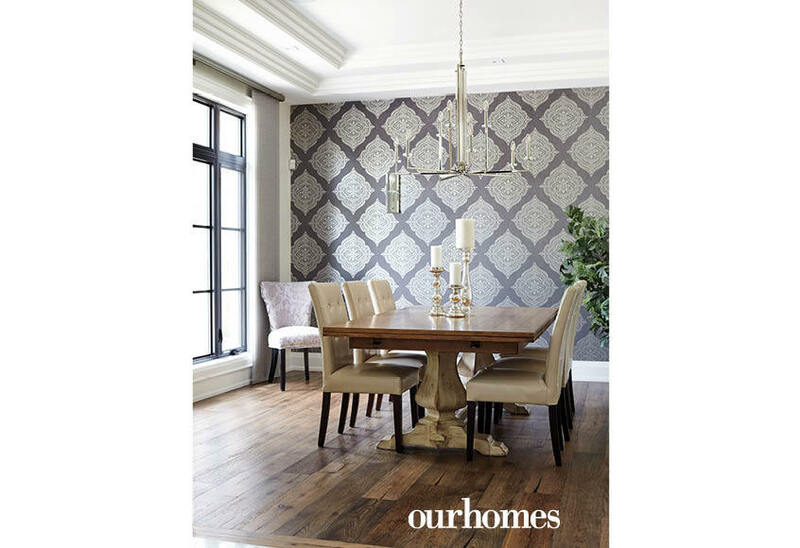 In the dining room, wallpaper from Aftica Decor sets the background for the a gorgeous table from Stoney Creek Furniture. Blinds by Girgenti Custom Window Treatments complete the space. Fabulous first impressions! The three-car garage opens to the backyard for easy access. Cheryl LaPointe of LaPointe Interior Design & Landscape assisted with plant selection. The luxury Genesis G70 Sport, courtesy of Genesis Niagara. Marcello and Paula Alaimo with Anthony, Vanessa and Charles. Paula’s space. “The kids know if they come in here, it’s a spot for reading and quiet things,” she says. A gorgeous table and wallpaper enhance the dining room. High ceilings and generous windows contribute to the bright, spacious atmosphere of the kitchen. The arabesque tiles of the backsplash echo the dining room wallpaper and roofing shingles. Cabinet doors disguise the refrigerator. A two room butler’s pantry, with child-friendly access to storage links the kitchen and the dining room. 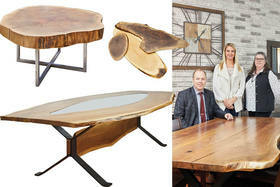 Room divider or striking design feature? 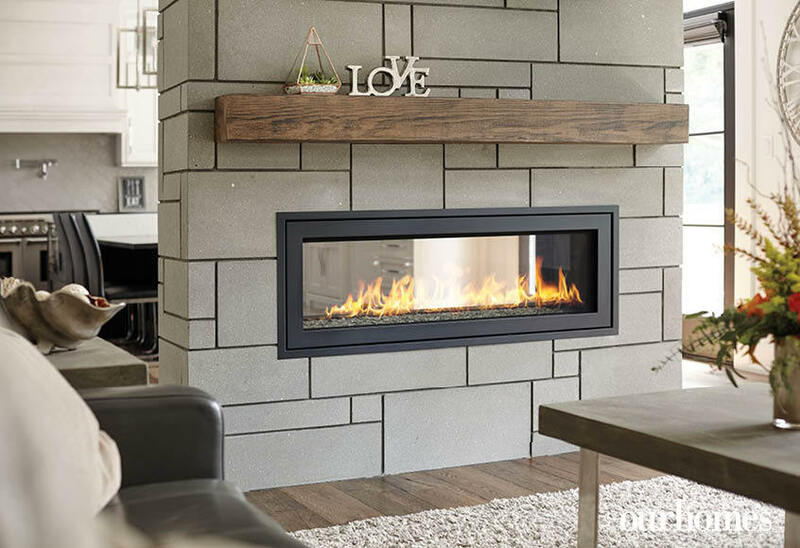 The two-way fireplace is both. 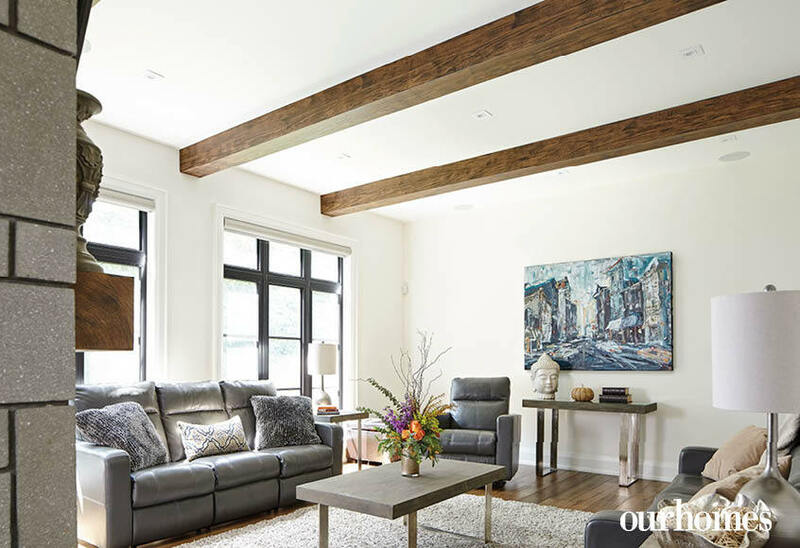 Wood beams add character and warmth to the living room. A covered porch off the kitchen makes for an extra entertainment area and place for the family to sit. “I can BBQ all year round!” enthuses Marcello. 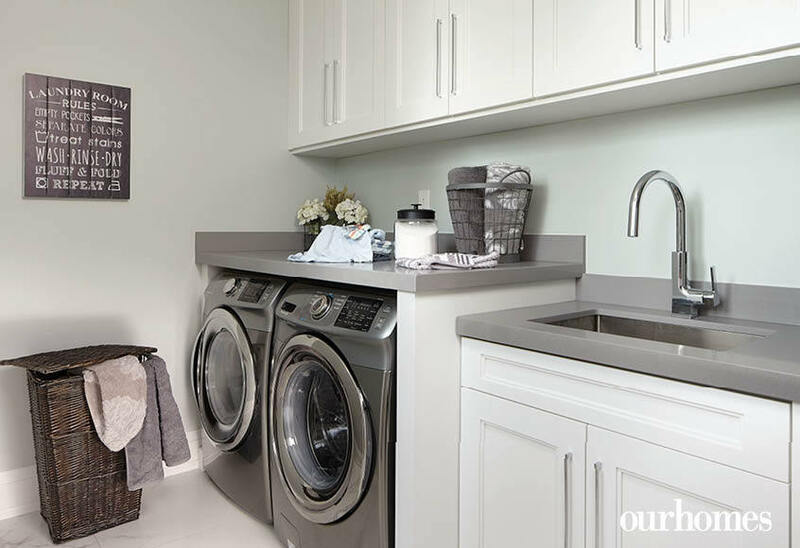 Hard wearing, and beautiful, tile flooring from The Flooring Warehouse is repeated in the laundry room, bathrooms and mudroom. 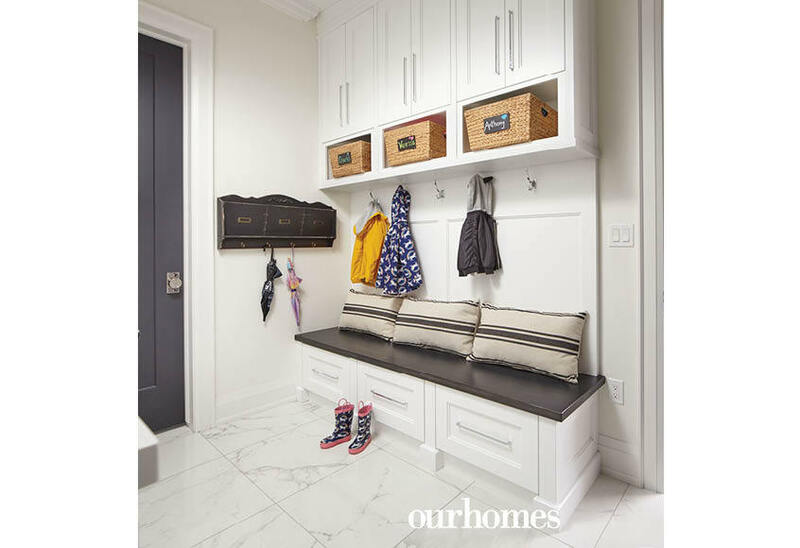 Clever storage ideas are implemented throughout the home. The landing overlooks the entryway, and includes a unique display wall. A tray ceiling adds architectural interest. The staircase, leading right from the lower level to the main floor and up to the second floor, is decidedly modern. 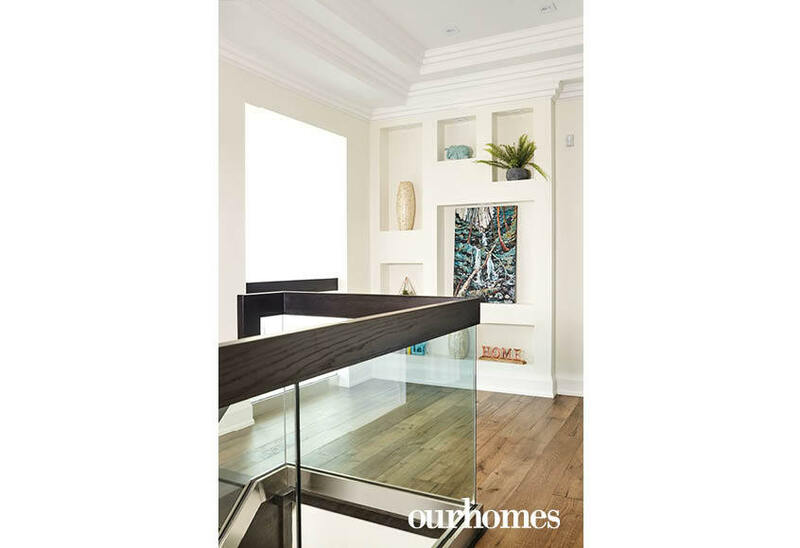 Open riser wooden steps are stained black to tie in with the windows and accented by two by six-inch wood handrails. 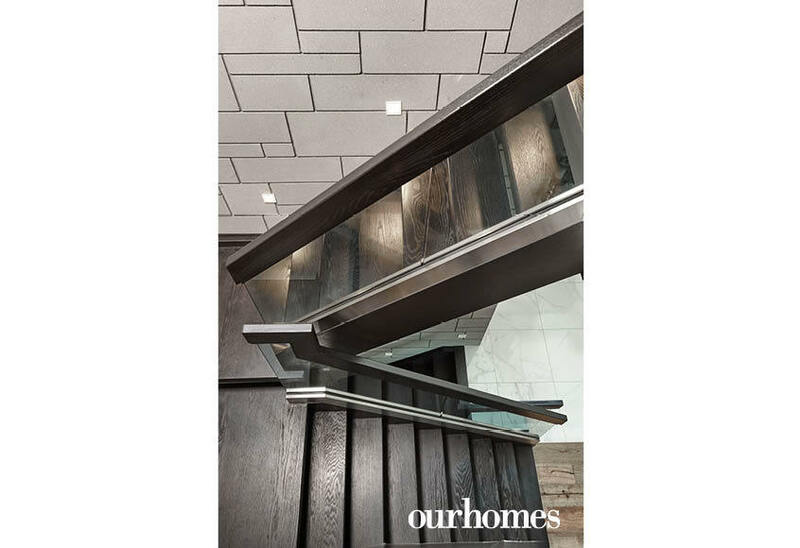 Built-in lighting accents the distinctive staircase. 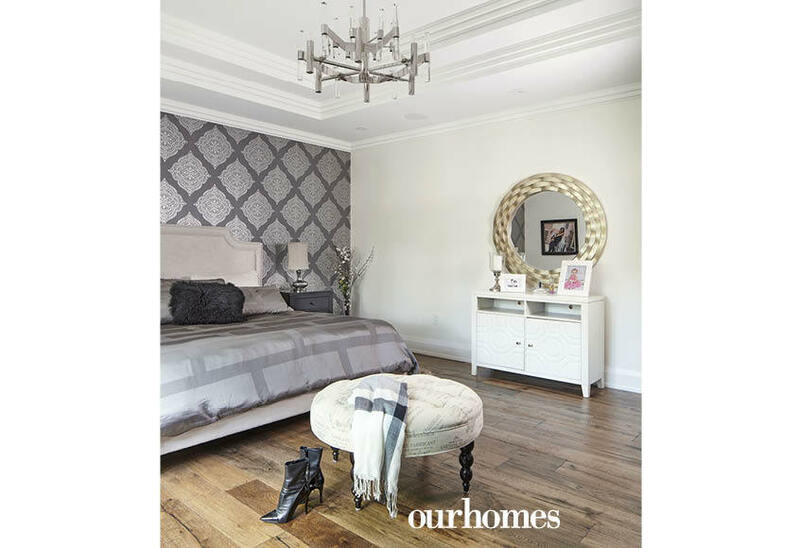 Accents and finishes carry through the home, such as this wallpaper in both the master bedroom and the dining room. The master en suite has a glass enclosed walk-in shower, his-and-hers sinks, a tub and a vanity for Paula. The Alaimos designed the children’s roomy bedrooms for longevity. Vanessa has her own bathroom with shower.